Repairing clogged plumbing is a frustrating and often expensive affair that most homeowners grapple with occasionally. While preparing solid ingredients away from sinks minimizes its incidence significantly, installing a garbage disposal unit is the best remedy. Featuring compact and universal designs that install under sinks, they work discretely in most settings. Their motor driven systems (electrical), on the other hand, pulverize solids on contact, which eases their disposal via plumbing systems. To satisfy the global demand witnessed in recent years, several companies are currently involved in their production. They have exploited technology to develop powerful units with the 10 we have listed of the best. Buy one to solve your plumbing issues permanently without spending bucket-loads of money. 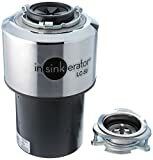 Trusted globally because of its reliability, Insinkerator is a popular line of garbage disposal units or home and commercial use. This light capacity LC-50-11 model, for instance, is a top-rated base unit with a 1/2 horsepower motor that works efficiently. Upon contact, it pulverizes solids into small pieces that do not clog plumbing systems. Recommended for use with most types of sinks, installation is easy. Simply bolt it onto your sink and connect it to an electrical outlet to enjoy real-time protection against clogs. Even with its immense power, Insinkerator LC-50-11 works quietly in the background once set up correctly. 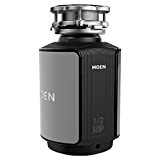 With this X Series Moen GXS75C, you get a powerful 3/4 horsepower disposal unit with impressive grinding capabilities (2700RPM). Instead of your tough kitchen scraps clogging your sink, it will eliminate them efficiently and spare you hefty repair costs. Designed to work in sinks, the three-bolt mounting system offered (universal) is easy to setup. Unlike some models that require professional set up, all you need are a few standard tools to install it correctly. Moen GXS75C (GX Series) is electricity powered. The fixed magnetic motor it uses is jam proof while its advanced SoundShield contains noise. Forget about the annoying buzzing sound your current unit generates. Featuring a novel batch feeding technology that maintains a consistent grinding power, Waste King 9900TC handles heavy-duty waste disposal well. Installed in a home or commercial setting, users get grinding speeds of up to 2700RPM. This is sufficient for grinding the toughest of food residues. All components (including its case and blades) are rust proof. The 36-inch power cord offered eases its setup. The manufacturer’s warranty offered, on the other hand, demonstrates Waste King’s commitment to quality. Once setup, therefore, this unit rarely breaks down, clogs, nor compromises the experience of users. 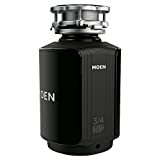 With self-sufficient waste disposal units such as Moen GX50C attainable cheap online, waste management is no longer an issue. If you experience frequent plumbing issues, for instance, buy one to get a powerful 1/2 horsepower unit that never disappoints. Operating at 2600RPM, its motor-driven system pulverizes the toughest of residues. Jamming and noise are non-existent, while its long pre-installed power cord eases its installation in most kitchens. Once you have bolted its mounting assembly onto your kitchen, plug it into an active electrical outlet to enjoy real-time protection. Installed in homes, users of Moen GX50C enjoy a 4-year warranty for production defects. Fitted with a quiet Dura-Drive induction motor (3/4 horsepower), InSinkErator Badger 5XP is a convenient household accessory that delivers. Unlike some under-powered units, the 3/4 horsepower it generates is sufficient for grinding the toughest of residues. Its grinding system (galvanized steel) is durable, while the large grind chamber offered accommodates up to 26-ounces of material. By grinding and disposing of large batches of material, its efficiency increases. This translates to better cost saving. This USA-made disposal unit has a detachable power cord, a limited (3-years) in-home warranty, and all mandatory tools for installation. 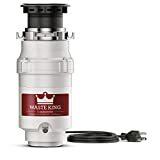 Measuring 12.68 x 5.18-inches, Waste King L-1001 is a compact garbage disposer with an effective continuous feed system. Unlike InSinkErator Badger 5XP with an on-board chamber, this model works in real time, which makes it ideal for commercial use. The 1/2 horsepower motor it uses delivers heart-stopping power (up to 2600RPM) while its removable splashguard contains messes well. Waste King L-1001 features a long (36-inch) built-in power cord. Its mounting system, on the other hand, is simple and universal, while its low maintenance design works error free for years. Buy yours to get an in-home warranty (two years). 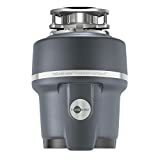 A popular powerful garbage disposal unit, InSinkErator Evolution Excel delivers up to 1.0 horsepower of grinding power. Compared to standard disposers, therefore, it grinds faster. The finer grinding results that it delivers, on the other hand, prevents clogs better. When in use, users to do not contend with the annoying loud sound some disposers generate. Its induction motor (dura-drive) is super quiet. It also has a quiet MultiGrind technology and a SoundSeal technology that neutralizes sound further. InSinkErator Evolution Excel has durable stainless steel components and a 7-year warranty (in-home). 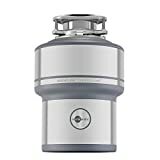 Popular in top 10 best garbage disposal, this compact InSinkErator Evolution unit delivers in most settings. Its low-profile design, for instance, installs conveniently under sinks. Its motor (3/4 horsepower) is quiet, powerful, and uses a unique MultiGrind technology to pulverize the toughest of food wastes. This is unlike some poor quality standard units that often clog when overwhelmed by residues. Finally, components are durable, vibration-free, and housed in a 34.6-ounce grinding chamber with a SoundSeal technology. Are you tired of paying a plumber to unclog your kitchen plumbing often? 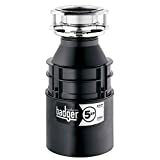 InSinkErator Badger 5 is a simple remedy that will save you significant amounts of money over the years. Affordable, for instance, you no longer have to spend a lot of money to maintain a functional plumbing system. Power output (1/2 horsepower) is desirable, while its quiet solid design is not only easy to setup but also durable. 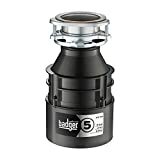 As all InSinkErator products, Badger 5 is USA-made, has a spacious grind chamber (26-ounces), and has an in-home warranty (2-years). 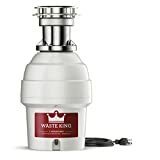 For proper garbage disposal at home, Waste King L-8000 is the best unit to use. Trusted globally, its unmatched grinding power (1.0 horsepower at 2800RPM) is a major strength. Whether you are handling soft or tough residues, it does a better job every time without overheating. It also has a leak/noise-proof case, a universal mount that fits on most sinks, and a clog-proof continuous feed system.